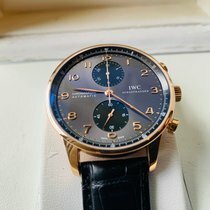 A fine 18ct yellow gold IWC Portugieser chronograph, model reference IW371416. 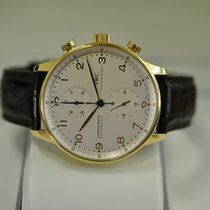 A 40.9mm diameter chronograph with ivory dial with Roman numerals, brown alligator strap with 18ct gold pin buckle. 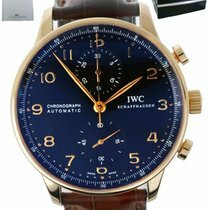 Complete with the IWC presentation boxes, instructions, polishing cloth and warranty card. The watch was supplied new by Hamilton & Inches in Edinburgh on 15th July 2006. 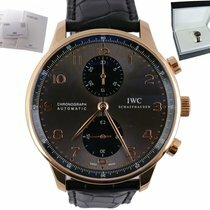 A fabulous watch, call Dominic to reserve it. We can deliver worldwide, call or email Dominic for more details.